We’re proud to announce the outstanding rankings SAP achieved this year in Potentialpark’s 2018 global rankings. Potentialpark ranks the companies that are the most talent-friendly and who best meet the habits and expectations of today’s candidates. The Potentialpark ranking reflects the performance of employers across all topics included in the Potentialpark Study: Career Website, Applying Online, Social Media, and Mobile experience. For the first time, Potentialpark also did a global ranking this year whereby SAP ranked #3 among the Best Employers in digital Talent Communication! 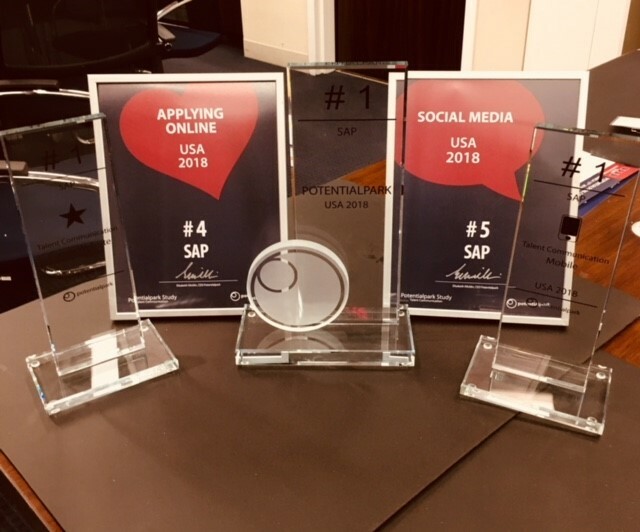 In addition to that, SAP was recognized with a 1st place ranking in the USA among the Best Employers in Digital Talent Communication, with a 1st place for our Career website and 1st in the mobile ranking! SAP placed high on the rankings in Asia, Germany, and overall in Europe in the various topics covered. Potentialpark has two different research approaches: qualitative and quantitative. With the qualitative approach, Potentialpark collects every year statistical relevant data globally and turns them into insights for employers. They then ask a panel of candidates to test career channels and give direct feedback about a specific employer. 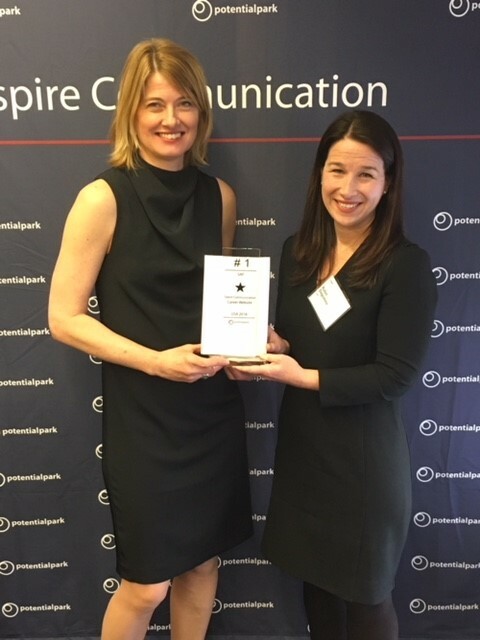 Global Employer Branding’s Creative Media Director, Robin Dagostino accepting Potentialpark’s awards on behalf of SAP. A few of the awards SAP in the USA won from Potentialpark.